How can such a simple food bring such enormous pleasure? We ask ourselves this question every time we step up to the take-out counter at Patsy’s Pizzeria (2287 1st Ave b/w 117th & 118th). While we wait to order a slice or two, we contemplate what makes this eating experience so good. Some folks swear by the pies in the dining room, but we prefer the tiny (and usually crowded) take-out space. It’s nothing fancy–just two workers, a TV always blasting Telemundo or Univision, a Coke machine, a wooden counter, and the best damn slices anywhere. 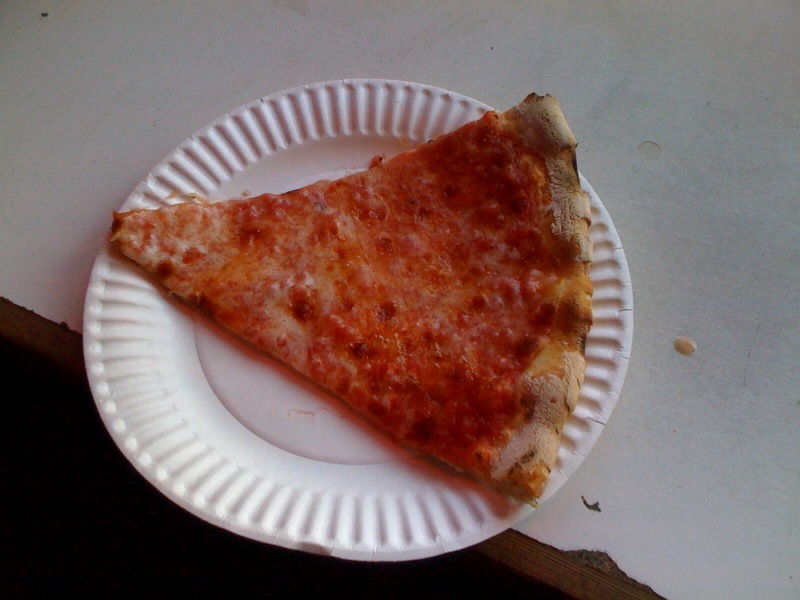 This is a New York pizza experience of the old-school variety that’s almost impossible to find in 2011. 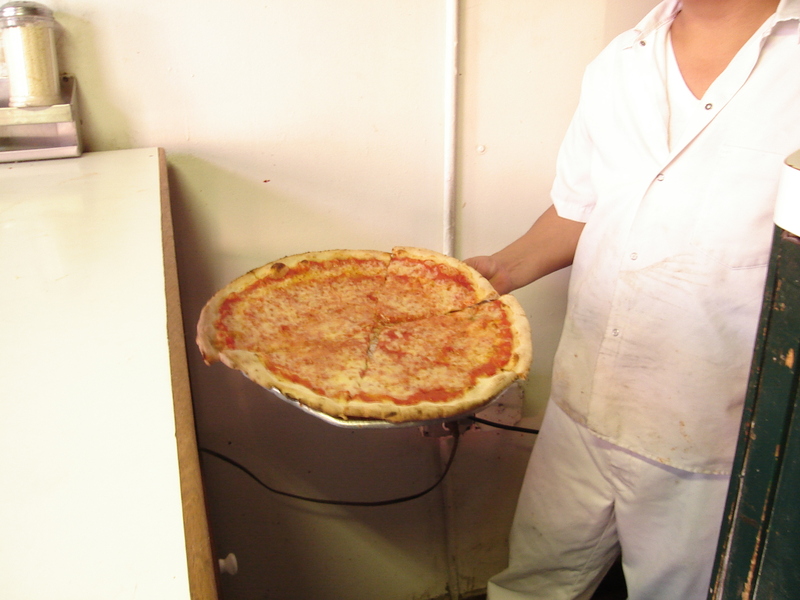 While one guy sweats away making pies as fast as he can, the other guy serves up the $1.75 slices to the constantly rotating crew of East Harlem locals, truck drivers, school kids, cops, suburbanites on their way back to Connecticut, and any other type of human you can think of. There is a constant pile of vehicles taking up parts of two lanes on First Avenue. The traffic cops don’t seem to care, since they’re in Patsy’s getting slices like everyone else. We usually stand at the counter by the window and devour our slice while watching this urban ballet of double parked cars and hungry folks jumping in and out of Patsy’s. But let’s get back to the slice. This coal oven blasted beauty is expertly crafted; the tangy sauce and ample amount of cheese sits perfectly on the charred dough. Proportions are everything in a good slice, and this one is very thin with a little bit of heaviness from the ingredients. 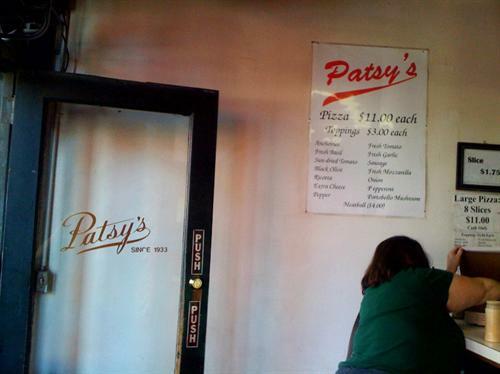 Size matters too, and Patsy’s slice is just right–not too big and not too small. Fold it up and take a bite. This is New York food for the masses before giant chains moved in and took away all the flavor, atmosphere, and neighborhood identity. That’s the beauty of Patsy’s. They’re not trying to be gourmet. They’re not selling t-shirts. They don’t even offer any slice other than cheese. They’re just making pizza the only way they know how. And since 1933, New Yorkers have been gratefully flocking to their door. 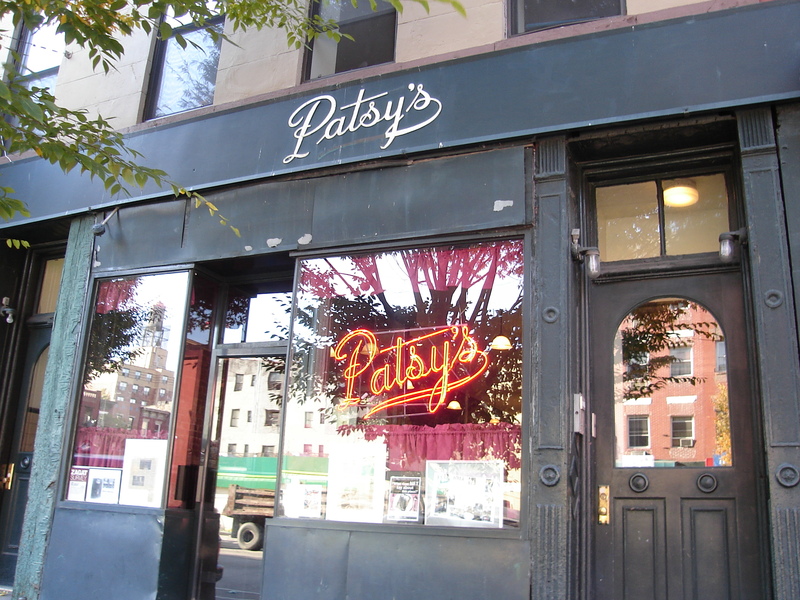 Long live Patsy’s of East Harlem. The perfect slice. C. Nelson, 2011. Another round of slices coming up. C. Nelson, 2011. The take out counter. C. Nelson, 2011. 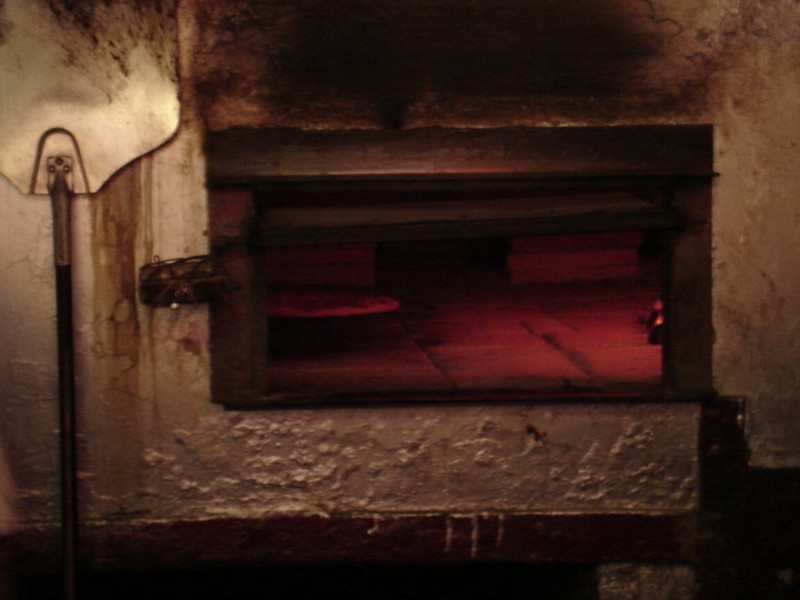 The ancient Patsy’s oven. C. Nelson, 2011. Still looking mighty fine after all those years. C. Nelson, 2011. 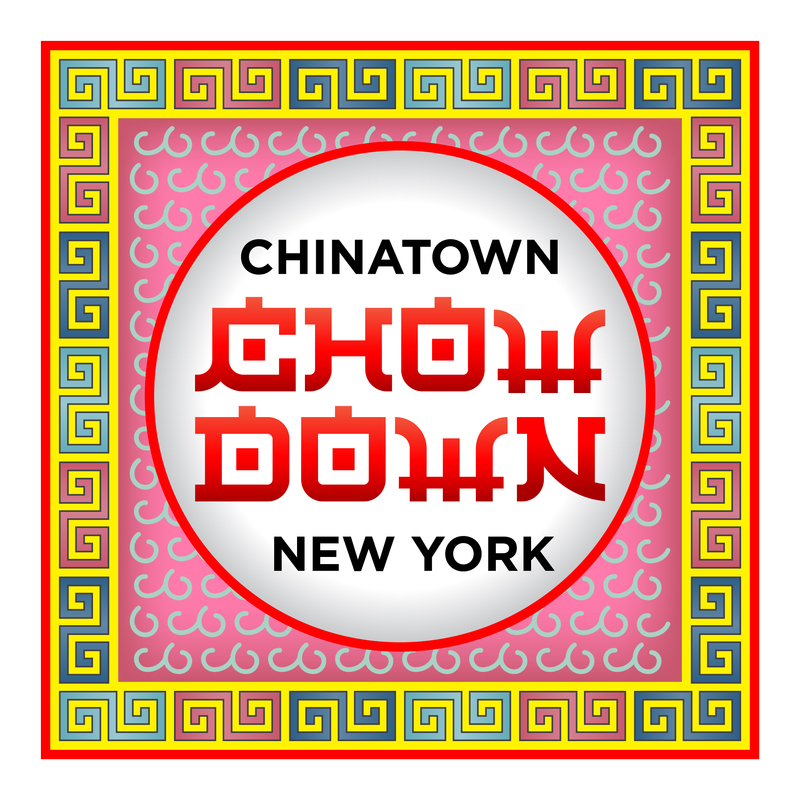 This entry was posted in East Harlem Life, Eat, Drink & Be Merry, Exploring New York City and tagged food, Manhattan, Patsy's, pizza, Spanish Harlem. Bookmark the permalink.